- Film grain effect makes it fuzzy. A solid effort for a fan film with some impressive FX, a must for Star Trek fans. Star Trek Horizon is a fan film, released on Friday, 26th Feb 2016, 2 days ahead of schedule, following 3 years of production. 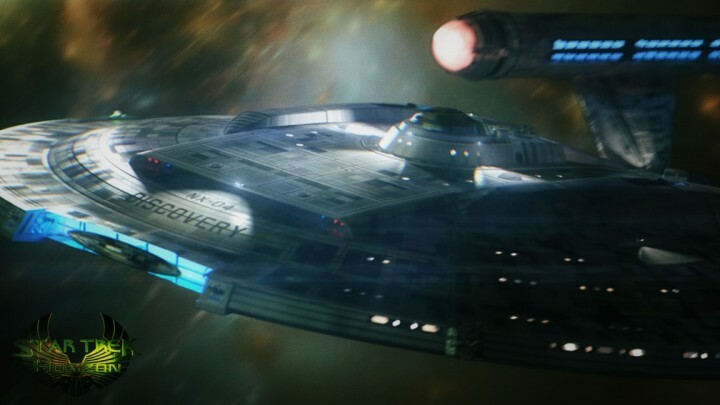 Set in the Enterprise time period, it follows the NX-04 Discovery and her crew during the war between the Coalition of Planets and the Romulans, and runs to 1 hour and 42 minutes. The quality overall is very good as fan films go. It shows a lot of ambition, with a wide scope, and a number of well-implemented skirmish scenes – you generally see a maximum of 5 or 6 ships at a time. While a Star Trek film naturally tend to focus on the bridge, they use a number of other locations well, and had some outdoor/planet hell type scene. The lighting is, unfortunately, quite dark, and this in combination with the slightly blurry film-grain effect they have used offset the good quality of the FX (The 3D models were very good) and costumes are authentic and well made. I must admit though I sometimes checked if it was playing in HD or SD. While the actors definitely aren’t professionals, their passion and enthusiasm for the project covers a multitude of sins. Sadly the weakest parts are the several occasions where the Enterprise shares the screen. The Captain of the Discovery hails them, and since they of course don’t have Jonathan Archer, there’s a simple message relay from the comms operator. It may have benefited from simply not mentioning the Enterprise and focusing on other starships of the time period like the Columbia, or maybe even some Andorian Guard vessels. Overall, I feel that Star Trek Horizons gets a solid 4/5 from me on first watch – I’ll no doubt come back to it again over the weekend.